A hellish landscape where domestic disputes last thousands of years, death doesn’t work and milk-drinking children make the rules. A place of gossiping neighbours gabbling venomous gibberish in dark corners whilst an inexplicable hum fills the air. 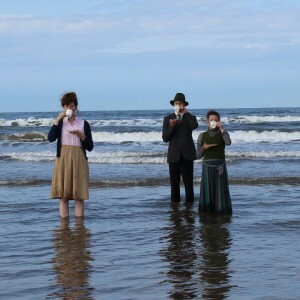 Award-winning Clout Theatre take a look at human frailty and the essential comedy in the meaninglessness of our lives. A visually arresting poem to the dead and the damned and an absurd take on religious morality. Nominated in the Total Theatre Awards 2012. "Ridiculous, hilarious, baffling and unnverving... a sheer pleasure"